Unschooling advocate Blake Boles is dedicated to helping teens learn on their own. He’s worked at Grace Llywellyn’s famed Not-Back-to-School camp, cycled through the Argentinian countryside with a group of unschoolers, and planned unconventional adventures for young people who choose to learn on their own. Blake’s first book, College Without High School will be on shelves this October. I was treated to a sneak-peek and am impressed with the insight Blake shares with teens who want to skip high school, pursue their own interests, and still make it to college. I asked Blake a few questions about how he became involved with the unschooling movement, where his educational philosophy has taken him, and how the theories behind unschooling shape his own life as a learner. You won’t want to miss his answers. 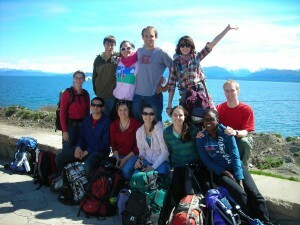 Photo: Blake Boles (top, center) with Unschool Adventures group in Argentina. How did you first become interested in helping unschooling teens learn on their own? In Spring 2003, when I was an astrophysics major at UC Berkeley, a friend handed me a John Taylor Gatto book and ignited my passion for unschooling and free schooling. I ended up changing my major to study those fields exclusively, but for years after graduating I wasn’t quite sure how to apply this passion outside the academic realm of reading and research. I knew that I liked working with teens from my time as an instructor at a wilderness summer camp, but the question of where to find these magical “self-directed teens” eluded me. A short-term internship at a Sudbury-model school (where youngsters dominated the scene) had left me unsatisfied. So, I wrote Grace Llewellyn an e-mail, remembering vaguely from my first reading of her Teenage Liberation Handbook that she ran a teen-only summer camp, and I asked her if I could become a staff member. She wrote back with an enthusiastic “yes”. Not Back to School Camp totally altered and informed my perception of homeschooling and unschooling. Previously, I think I held many of the common doubts about homeschooled teens: Are they really just social recluses? Do they have personalities? Can they actually read and write well? NBTSC blew those all away by showing me that unschooled homeschooled teens are really more like savvy high school graduates taking an extended gap year. (Literally, their social, emotional, and intellectual literacy levels were often on par with most high school graduates.) These teens were taking on challenges and projects at age 15, 16, or 17 that blew me away. And socially they were “normal,” “well-adjusted” kids with shares of healthy weirdness and idiosyncrasy. The first summer that I worked at NBTSC I spent one session there, and I returned the next year to work all three sessions. Since then, I haven’t looked back in my desire to work with unschooling (or more generally, “self-directed”) teens. Why are teens leaving school? What can they learn or accomplish on their own that can’t be done from a classroom? Teens choose to leave school for a variety of reason: intellectual, social, religious, and safety. My work involves teens who choose the intellectual and social reasons. Intellectually, a student may be held back by a slow teacher or curriculum, his academic interests may not be addressed by the school, or his learning style (especially kinesthetic) may be ignored. Socially, a teen may be frustrated by superficial and vicious social groupings, a dearth of worthwhile friends, or the unfulfilled desire to interact with the whole world–not just the little bubble of people her same age who happened to be born in the same area. For most of the teens who I work with, it’s some combination of these factors that drive them from school. Unschooling lets them undertake big learning projects and take ownership of the results. It’s a more adult way of learning, and it’s a lot more fun to boot! Leaving school is scary. What do you say to parents who worry that their teens will become socially awkward, deficient in necessary skills, or unable to make it to college? My initial response to these questions is: Yes, it could happen. If you pull your child from school, keep them at home all day, and insulate them from the world-at-large, then it’s perfectly possible to raise a socially stunted and untalented teen with no college preparatory assets. Homeschooling can be botched just as any form of education can be botched. Homeschooling done well, in my opinion, means actively getting the student out of the house (which is why I prefer the terms “unschooling” or “self-directed learning”), exposing them to a wide swath of real-life activities (especially the world of business via internships, job shadows, and employment), traveling, and joining in group activities large and small. The more that these are chosen by the student, the better. When homeschooling is done this way, social “adjustment” is a given; students learn skills because real life demands it of them (instead of a teacher’s decree); and college preparation is only a few steps away (by taking a few community college courses and a standardized test, for example). And for teens with a basic measure of independence, none of this absolutely requires one parent at home. My advice to parents who still worry about these common issues is to read, read, read, and then find local homeschooling groups who can give sage advice on specific issues. John Holt & Pat Farenga’s Teach Your Own and Grace Llewellyn’s Teenage Liberation Handbook are excellent places to start. If you could go back and re-do your teen years, what would you have done differently? I try to tactfully avoid this question when it arises, because I think it’s silly to hold any regrets about my teen years. But perhaps if I had been exposed to the ideology of self-education and embraced in my teen years, I would have gone on more backpacking trips in Sequoia and King’s Canyon National Parks, which were a scant 2-hour drive away from my hometown of Bakersfield, CA. At the time I was more interested in playing computer games. How have your new beliefs about education affected how you learn as an adult? At the core of unschooling is the belief that everything is a learning experience, and therefore every failure is an opportunity for growth. As I’ve struggled to find my career path as a young adult, the ability to embrace failure has helped me immensely. Also, over the past years I’ve kept a line of study (currently it’s political philosophy) just for myself. Not for a class, not for a test, just me. I love it. Many teens are unable to stop attending school and many adults have already passed that point. Is there anything about the unschooling philosophy that can help them? I feel that unschooling is a philosophy consistent with American individualism, which relishes self-reliance and self-direction. These are the roots of self-education. By acknowledging that only you can truly motivate yourself to learn, any teen or adult can build their confidence and independence. Unschooling helps people get over the (artificially instilled) belief that learning stops when school stops, or in other words, an institution or other external motivator is required for you to learn. Through your program, Unschool Adventures, you take groups of unschooling teens on some pretty exciting trips. Tell us about a couple of your best outings. chose the destinations, arranged travel and accommodations, and motivated themselves when they were bored); and finally, a semi-structured segment in Buenos Aires (where we took Argentine Tango lessons, explored the neighborhoods of the city, and got a few students involved in volunteering and job shadows). Each day we cooked for ourselves, had “check-in” meetings, and asked if anyone had changes to propose for the daily schedule. The trip, by everyone’s measure, was a total success. Abbi (my co-leader and fellow Not Back to School Camp staffer) and I walked away totally jazzed to lead more adventures, and thus the company solidified. For a specific example of one of our “best outings”, I think our day-long bike ride around the “Chico Circuit” outside of Bariloche takes the cake. The 25km-long circuit wound around a beautiful wooded peninsula surrounded by a large lake, from which the Andean mountains jutted up into space. Even Quincie, our beloved student from Austin who wished that “nature doesn’t have to be uphill,” walked away smiling. Our next two planned trips include a month-long novel-writing retreat on the Oregon coast in November 2009 and a huge 6-week adventure around Eastern Australia in January and February of 2010. (Anyone interested should check out our website, www.unschooladventures.com). If you could give one piece of advice to high schoolers and other learners, what would it be? Take a block of time–the bigger, the better–to figure out what really matters to you. For graduating high schoolers, this might mean taking a year-long gap year. For younger teens frustrated with school, this might mean taking a “deschooling vacation” during the school year. Unschooling is just a vehicle for doing what matters most to you. The trick, of course, is that you’ve got to figure out what matters first. Do you have any other projects or programs for teens in the works right now? Currently I’m developing a 2-week leadership retreat program for teenage homeschoolers and unschoolers. The approach will be more structured and draw on my experience as a leadership trainer at my wilderness summer camp. The first retreat will likely be held in Ashland, Oregon in May 2010. Students will have the opportunity to do one-on-one mentorships with advanced college students (in an area of mutual academic interest), create their own short-term internship or job shadow, get trained in lots of hands-on leadership skills, experience a high ropes course, and do fun stuff like cook for a group, visit Crater Lake, see a Shakespeare Festival play, and more. Families interested can visit my personal website (blakeboles.com) or just shoot me an e-mail at blake@collegewithouthighschool.com. College Without High School hit bookshelves in October 2009. If you’re as exicted about the release as I am, you can pre-order a copy with the publisher (www.newsociety.com) for a 20% discount any time before September 1st. 5 Comments on "Adventures in Unschooling: Interview with Blake Boles"
What a fantastic idea! I loved this post. As a home educator for my three sons, one of whom is 15, the information here presents some fantastic ideas for our own educational adventures. I must also say I am a huge fan of your blog in general and always find something wonderful here. I’m glad you enjoyed the post, Joe. Blake’s adventures are inspiring me to think up some of my own trips as well! Hopefully you and your sons will come up with some amazing ideas. I am glad to have read this article. Un-schooling has been previously portrayed to me in some very unkind light. However, this article has really opened my eyes. I think that for teens, this concept is a great one, and could be the very thing that gets them interested in learning. I’ve been a fan of John Taylor Gatto for a long long time. Frankly, secondary education is a waste of time, effort, and money. It damages the mental health of those who attend them and has as it’s primary goal the enslavement and eventual destruction of those who attend them. It is a trap that should be avoided any way possible. I dearly wish that I had quit school as soon as it was legal for me to quit or even sooner. It was without a doubt one of the two worst experiences of my life along with having to talk with. Let the arrogant have them to themselves and let the donkeys kick and laugh at all they wish to disappoint of but for me they are worthless. My advice is run, run as fast as you can from high school. In regards to this topic, it is not so easy to search for savvy ideas on the Web. Thanks for sharing your opinions on natural health and related topics. By the way, do you have any good opinions on where I can find more useful recommendations on the Web? Keep up the great work!